I saw that when it was mentioned on the BBC website, and I found it interesting enough to follow up on. I downloaded the preview issue from their website. The premise was interesting although that genre of superhero comic doesn't really do much for me generally. But for that sort of thing, it was ok. I didn't feel like I was being beaten over the head with religious themes. 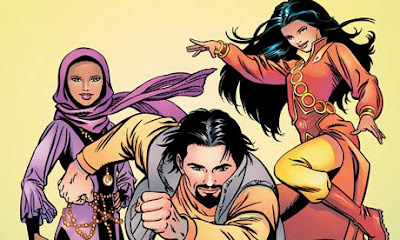 If the Islamic world and Islamic kids need role models, they could do worse than comic book heroes. I don't see anything religious in the theme of these superheroes. Just a change of name and appearances more suited to the prospected viewers/readers. By the way, Salman, this is only tangentially related, but have you seen Persepolis? I only learned about it because of publicity about the "fan fiction"(?) version (Persepolis 2.0) which used the characters to talk about the Iranian election and crackdown. Both the original and the latter are beautiful work. I might track down the movie if I can find it. Yes, I did see the movie, Persepolis. I think it is beautifully done (apparently it follows the book quite faithfully) - but I found the narrative to be a bit inconsistent. I loved the first act - and also the bits when she goes back to Iran and the impact of the Iran-Iraq war. While on the topic of movies based on graphic novels, check out "Waltz with Bashir". It is very well done! Also, check out this short clip by the same director.